Searching for a Manti, Utah Motel? Whether trying to escape the hectic city life for the weekend, or simply coming to enjoy the many outdoor activities and beautiful scenery of Central Utah, the Manti Country Village Motel is your ideal choice for lodging in Sanpete County. We are centrally located just a few blocks from the beautiful historic Manti LDS Temple, only 7 miles South from Ephraim and Snow College, and just 5 miles North from Palisade State Park and Golf course. At the Manti Country Village you will find the best 24 hour customer service, amenities and accommodations, all for an affordable price. Here you will find the perfect place to reconnect with each other and disconnect from the world. 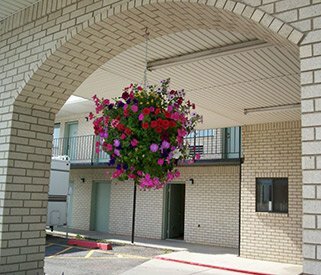 With our large selection of rooms, equipped with queen-sized beds or king-sized beds, and even our select pet-friendly rooms, there is something for everyone at the Manti Country Village Motel. We have two great family suites as well. One including 3 queen size beds and the other has 4 queen size beds. Just across the parking lot, enjoy Dirk's Farmhouse Restaurant. Dirk's is a full service restaurant ready to serve all of your dining needs. "Please come in and try our fresh medley of delicious traditional Sanpete favorites as well as our creative soups, salads, and pastas, our versatile Panini sandwiches, unique burgers, and tasty appetizers, our flavorful entrees and our killer Prime Rib on Fridays and Saturdays. When people choose to stay at the motel they will receive a discount coupon for the restaurant.